I have recently read a lot of articles about the IoT, how hype it has become and many ways it could help people work out problems. 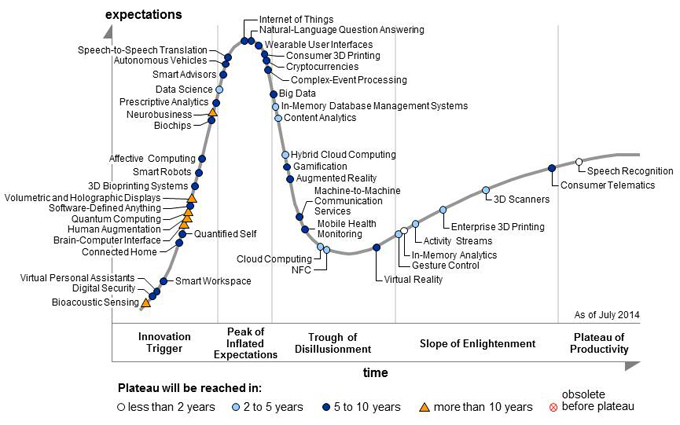 According to Gatner’s Hype Cycle report for 2014, it has reached the peak of expectation for coming technologies. The Internet of Things is a concept that envolves the use of embedded computing devices connected to real objects, passing on information about them such as location, measures made by sensors, thus improving decision making by humans involved in the use of these objects. Coming across the video below made me think about how the IoT and a Smart city would be connected. It happens that they are fully connected. On one side there is the data collection made by the embedded devices connected to different objects spread over the city, while on the other side there are the servers responsible for processing this data and make it available to the world via the Internet. The concept involves M2M communication (Machine to Machine), without human intervention. It is not new the benefits brought about by this smart data treatment. For example, by using the world famous traffic mobile application Waze, you turn your mobile device into an object sending data to Waze’s servers, which then process the data and return to you the best way to avoid heavy traffic.